The European peacock butterfly is a well-known colourful butterfly, found in temperate Europe and Asia. 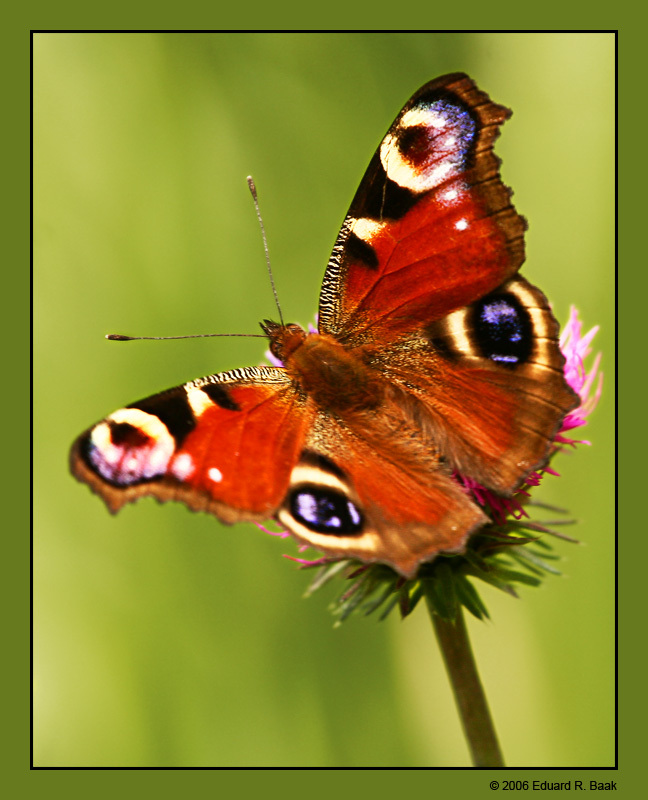 It should not be confused or classified with any of the other butteflies known as "peacock" in the Anartia genus of butterflies. It is the only member of the genus Inachis. The species is resident in much of its range, often wintering in buildings or trees. It therefore often appears quite early in spring. The butterfly measures about 5 cm (2 in) from wingtip to wingtip and is easily identified by its striking eye pattern on a ruddy background, although with wings closed the cryptically coloured underwings make it look like a dead leaf. The eyespots are reminiscent of those on the feathers of the peacock, hence the name. They are believed to be used to frighten predators (such as birds) by creating a false perception of another predator. A very nice shot on this Peacock Butterly. Nicely isolated from the backround. Excellent color saturation. DOF is a little shallow, but the detail is sharp in the central area of the butterfly. Nice shot! Very good capture. You have done it very well. Congratulations. Une merveilleuse photo que ce Joli papillon,Tr�s belle composition, les couleurs et le cadrage et les d�tails sont tous tr�s bons. A good capture of this colourful butterfy. I like the background, composition and the frame. Perhaps the butterfly could have been a little better focussed in places, but I know how hard it is. Well composed picture. Great color saturation and contrast. The focus on butterfly may be a bit soft but well seen and appreciable. What a beautiful shot of the Peacock Butterfly, the detail and colours are great and the background is great too. Peacocks are my favourite so thanks for sharing. Hello Eduard, this is a very good colourful shot. The composition is excellent. I think the focus is a little misdirected onto the far wing and with a limited DOF as you had here it's best to direct the focal point to the head. Well done. Not that sharp but beautiful composition. Great colours, BG, light POV and frame.